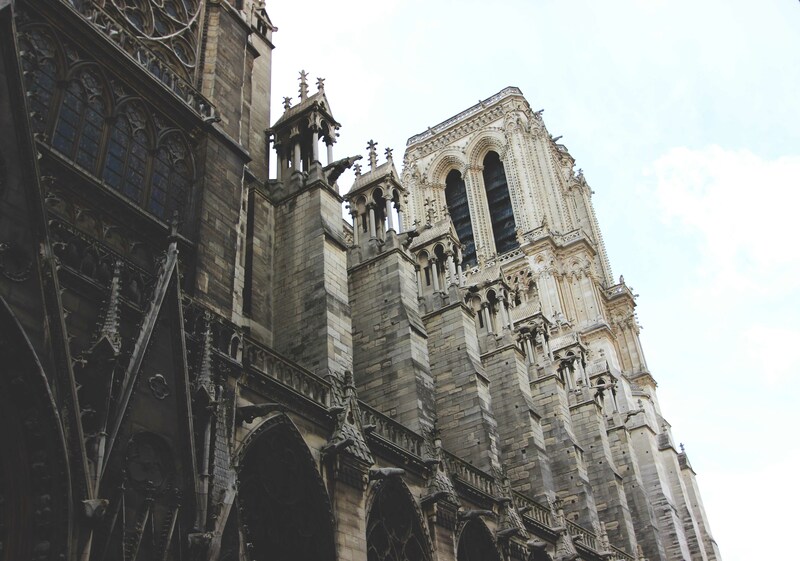 Notre Dame de Paris is one of France’s most notable structures. A definitive example of French Gothic architecture, it was made most famous by Victor Hugo’s 1831 novel Notre Dame de Paris or, as we know it today, The Hunchback of Notre Dame. Construction started on this cathedral in the late 1100’s BC and took nearly 200 years to complete. The construction spanned nearly the entire Gothic period, solidifying its importance as the prime example of this style. It is the home of some of the first flying buttresses, used to stabilize the massive stone walls, pierced by art glass windows. 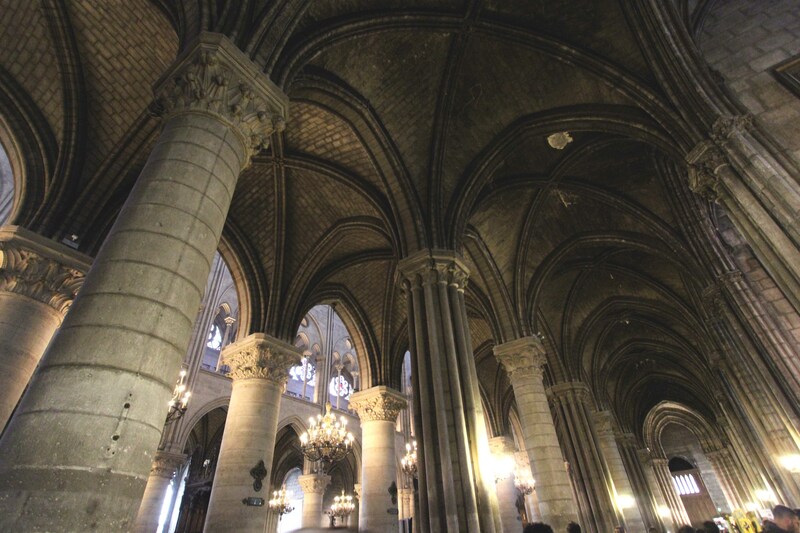 Upward sweeping grouped pillars, broken arches, and ribbed vaulting can all be seen throughout the building, characterizing the time period. The front facade is also extremely ornate, with each portal telling a unique biblical story. The ribbed vaulting was, to me, one of the most gorgeous features, and I spent a good amount of time attempting to properly photograph it. Rhythmic, dramatic, and genius, this invention revolutionized engineering and architecture. Notre Dame, as it stands today, exists because of Victor Hugo’s 1831 portrayal of the building. At the time that the book was written, it has suffered centuries of abuse and neglect from a series of purges and those never ending French Revolutions. It was, as one point, used as a stable and store house. Sculptures were knocked off of the facade, bells were melted down and some original stained glass windows were destroyed. Victor Hugo’s Notre Dame, however, was described as he imagined it was in its most glorious time, the 15th century. The novel caught international attention across Europe, was translated into multiple languages and quickly caused a tourist influx to the city of Paris. 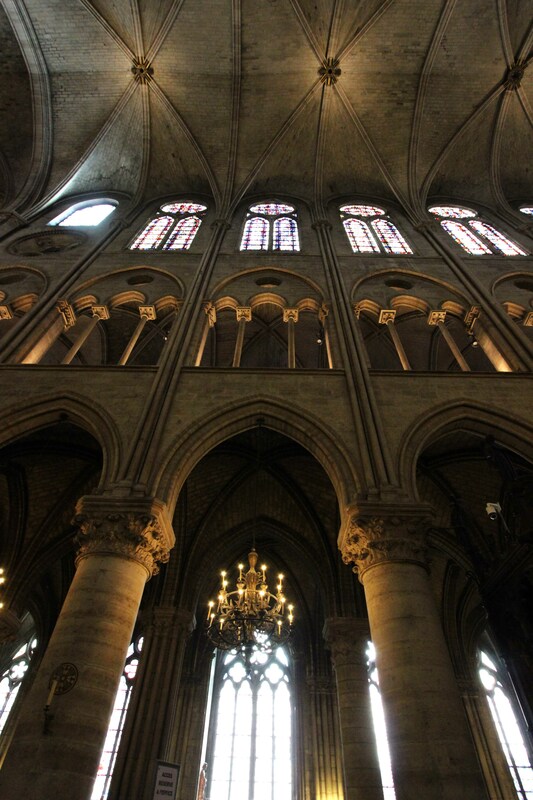 However, the tourists arrived to find Notre Dame of the 19th century rather than the 15th, and were very distraught. They found a dilapidated old cathedral, in near ruins, slated for destruction in the coming months. 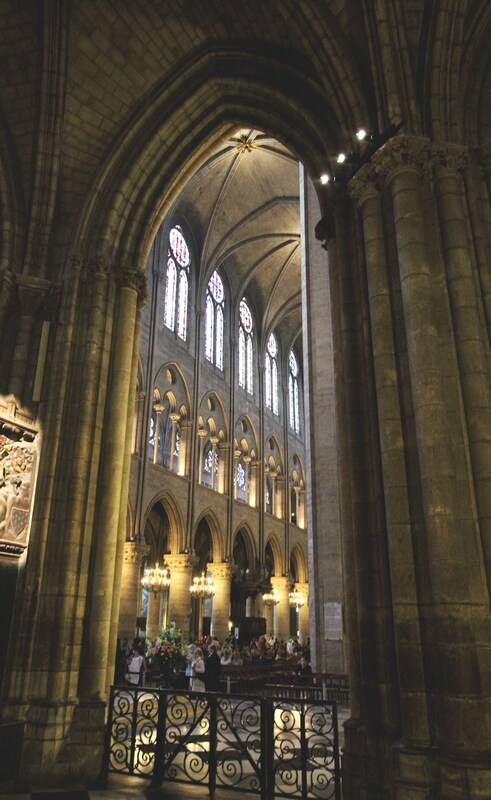 Their disappointment in its current state combined with the glorious cathedral written by Hugo that lived in their imaginations and the imaginations of all Parisians prompted the restoration of the cathedral in 1845. Today, Notre Dame welcomes over 13 million visitors each year and is one of the most visited attraction in the city (and one of the most visited churches in the world). It exists as it was intended to when it was first built, as Victor Hugo brought to life in his novel: a tribute to the ingenuity and vision of Gothic architects and engineers, a sanctuary dedicated to the Virgin Mary, and a symbol of the French people’s pride in their history and monuments. Architecture is most fascinating to me when it is considered in the frame of time and politics. This building is older than my country, America. It has seen wars and revolutions, and yet it still stands. It was reduced to rubble by neglect, defaced by reformers, and threatened by advancing battle lines, but the people of France and Europe demanded its restoration so it could stand as a symbol of Paris as it once was. Part of me really wishes that some marks of its history still remained. I read a fascinating book, The Secret Lives of Buildings by Edward Hollis that makes a strong case for preservation -and some times graceful degradation- rather than restoration, arguing that buildings should bear their battle scars and show the signs of history and politics that have been imposed upon them. 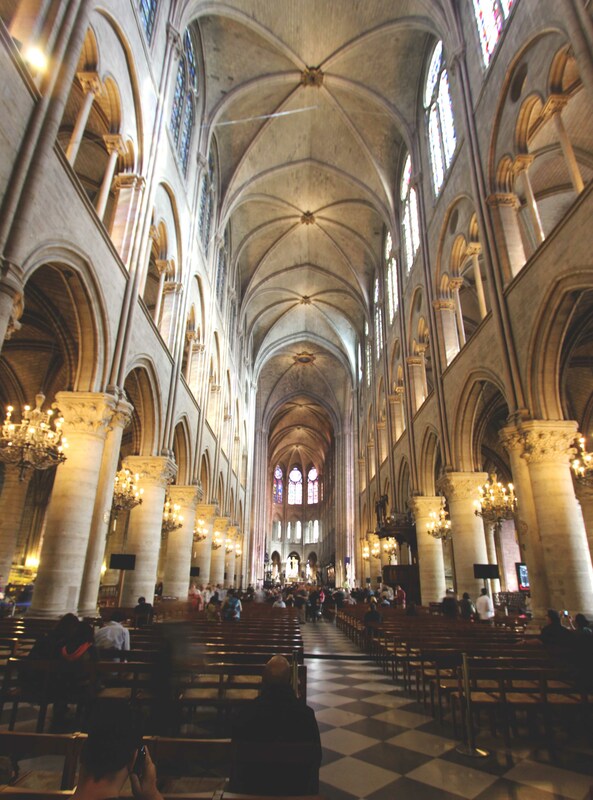 He discusses how Victor Hugo’s novel both saved and destroyed Notre Dame- for now it is a gleaming example of what was one, not was has been. It is idealized. It is, in a sense, a lie. Because it did not emerge unscathed through history. It was not always respected and revered. According to this argument, we should respect the history of the city and the people over the idealized version of the building. That being said, I am happy that it exists as an example of this architectural style and as a point of pilgrimage for many-be it for faith, ingenuity or Hugo-homage. What are your thoughts about restoration, preservation, and tourism in these iconic cities? Is it best that this rich culture has been made available to the masses, or has some of the essence of the place been degraded?